Born in Debrecen 53 years ago, Mr. Kósa was the long-time mayor of his town and also an MP since 1998. 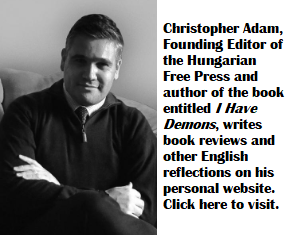 He served on several parliamentary committees and became a key leader of Fidesz’s parliamentary faction. Recently he stepped down from the party leadership position and was appointed minister without a portfolio overseeing the “Modern Cities” program. Mr. Kósa’s nickname is Mr. Twenty Percent, referring to the bribe he allegedly expects for building projects in his hometown. He is not shy about his racist and anti-Muslim views and often makes anti-Semitic comments; he also admires Putin. Some defend Kósa by saying that the “loud-mouth” politician has no ideological agenda; he is just repeating ruling Fidesz party slogans a hundred times louder. 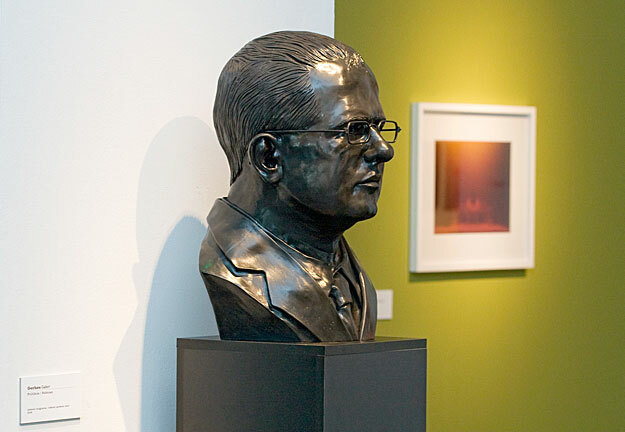 Debrecen was in the headlines recently when the city’s university honored Russian President Putin! The chancellor of the university is a protégée of Mr. Kósa. This is the Hungarian way – favors for favors. Friends promoting and helping each other from Debrecen while discrediting political opponents. 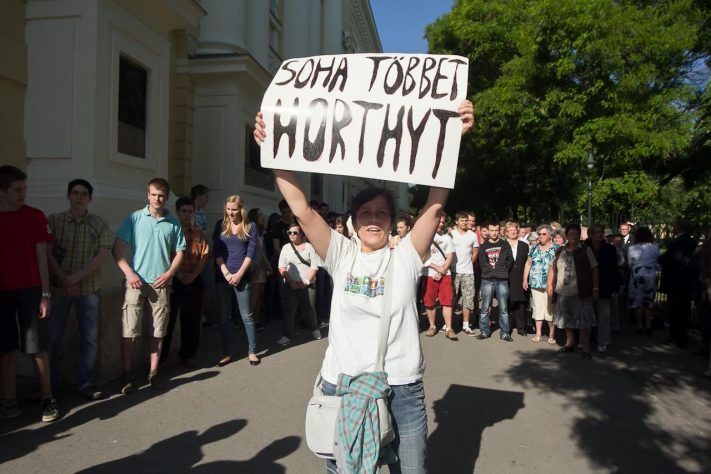 In 2012 young people demonstrated against the Horthy plaque at the Debrecen Kollégium building – the sign reads “Never again Horthy”. 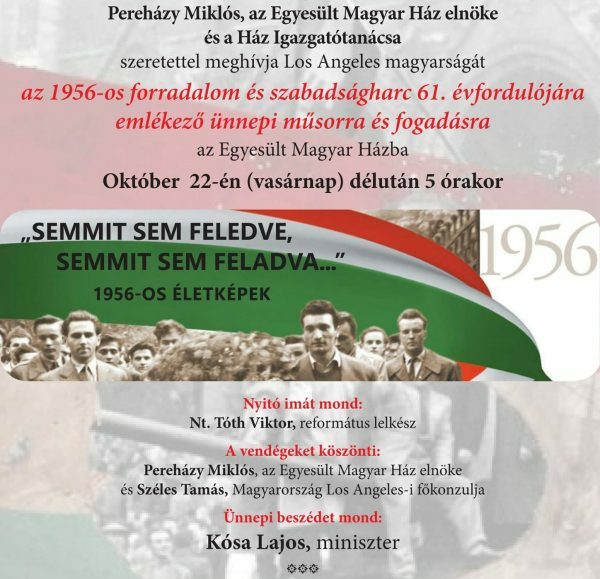 I find it simply shocking that in 2017 Californians, American citizens of Hungarian origin, invite a Hungarian politician who embraces fascists like Wass and Horthy. The Horthy regime declared war on the United States in 1941 and Mr. Kósa’s invitation is an insult to all Americans especially to veterans. This is a political provocation and we have to step up against it. I have no doubts that the vast majority of Hungarian Americans agree with me. Church and state are separated in the American system. 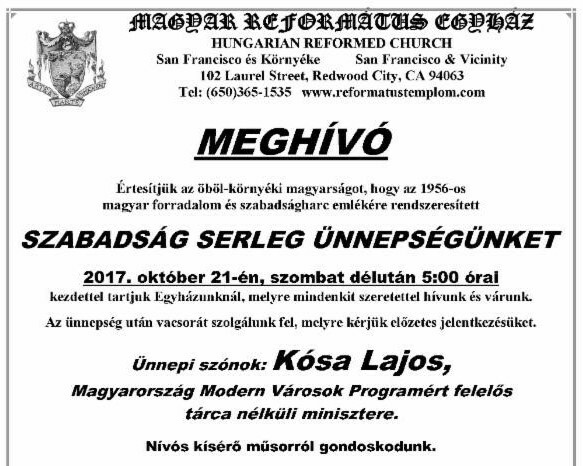 It seems that several Hungarian Reformed Churches in California might violate the law. While enjoying the tax benefits of religious institutions they appear to be engaged in political lobbying for the Orbán government. They should stop providing platform for racist and pro-fascist ideas! I call on Rev. Gábor Magyari-Köpe, Hungarian Reformed Church and Mr. Miklós Pereházy of the United Hungarian House to rescind Mr. Kósa’s invitation and find another suitable speaker for the occasion. We also ask our readers to contact Hungary’s new Ambassador in Washington DC, Mr. László Szabó (ambassador.was@mfa.gov.hu) to protest Mr. Kósa’s invitation. Is not Horthy dead for well over a half a century? So what the hell of a purpose can it serve to keep beating on a dead horse? If we want to talk all about long dead dictators, lets; start with Stalin, Rakosi and Kadar, etc. And just why the hell not ? If any one might be interested talk future of politacs, need to start with Nick Maduro, as wander what will hapen in Venezuela. Yesterday in Moscow news-conference, PBS news corespondence asked him about the food-shortages in his country. He claimed in his response, he never heard about it. What about commerade Kim Jon Un, will he start a nuklear war ? How about Cuba?. Raul is going to quit next year. Who will be his successor? What will come of it ? How will Cuba change ? if change at all. Or will just keep the struggle of the Cuban masses to hope for a future that likely never come?! Those are the issues that will affect the world of the commerades. Why silent about that ? Why just keep beating on a long dead horse, like Horthy? Mr.Lazar should stop bringing up Horthy again. Balint Magyar was not “discredited” in Berkeley, simply was exposed to different opinions. Moderate it at our pleasure. Proud of you Gyorgy! Let’s hear same from at least 50% of those reading this online site! Prove me wrong that Hungarians are more anti Semitic than even the Germans! amazed to see notation of his crowning achievement of Debrecen having it’s own tv channel. Quote “a wonderful propaganda tool for Fidesz. It was run by a close ally of Kósa, Mr. Tamás Széles whose hard work was rewarded last year with the Hungarian Consul ” Now lets compare that to the USA and its myriad of OWN tv channels and the propaganda they spread. Do you as the author see any possible similarities??? Nice to know that the few thousand people who regularly read these postings don’t bother to join the ranks of the lunatics who comment under these articles. As for Mr. Kósa, sad to say, he is welcomed with open arms by most of the organized diaspora groups in North America, because his government spends millions of dollars on these organizations. Mr Kosa’s party uses Hungarian taxpayers’ money to generate political capital for itself in the US and Canada. He too, like Mr. Trump, can claim, that even if he shot someone in the head in the main street of Debrecen, his backers would stand by him. 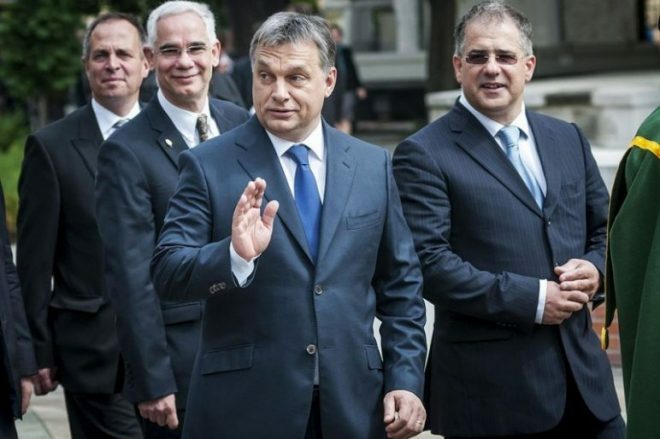 Mr Kosa’s main crime is not his fondness for a dictator who ruled Hungary before WWII. The reason why he should not be let into the US is because of his participation in a crime syndicate, that hijacked the rule of law from Hungary, and put a Mafia State in its place. Gason is that made up name for someone in a fog? Who exactly did cursed horthy save? Maybe your family ( who was not Jewish)….. The last time this happened at the Los Angeles Hungarian House, my father and I were the only two protesters. Most folks asked us why we had to air our dirty laundry. We’ll be there again. Hope others will join us. Lazar and Gollner are absolutely correct in their opinion above. The Fidesz trolls are quick to insert their verbal trash. Kosa is not only a leading member of the mafia state he is also known among his friends as having a rather low IQ. Go get’em 🙂 Thanks for standing up for Justice, and the Rule of Law.